Spinner dolphins are noted for their acrobatic leaps and spinning in the air. They jump very high and can spin 7 or more times before returning to the water. It is believed that these unique leaps are a form of communication and perhaps a way of identifying themselves to each other. These dolphins are slender and have a long beak with a dark tip. They are mostly dark gray. 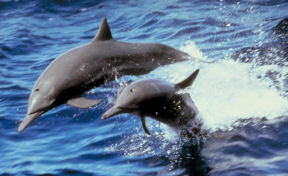 Spinner dolphins vary in appearance more than any of the other dolphin types. Some have a cream colored belly and there is often a distinctive connecting line. The average length of a Spinner dolphin is 8 feet and the average weight is 170 lbs. The males are usually slightly bigger than the females. They eat a large variety of fish and squid. Spinner dolphins are very social and several pods (dolphin families) may come together and swim in large groups of over 1000. These dolphins are found in tropical and subtropical oceans throughout the world. Includes detailed descriptions of different types of jumps and spins.